Multi-talented music industry entrepreneur David Victor, formerly of the classic rock band Boston, returns to Northern Nevada on Saturday, March 17 to perform with his tribute act Bostyx. Prior to the St. Patrick’s Day show at the Reno Nugget, David will spend Friday, March 16 from 2-5 PM as the Adams Hub Music Entrepreneur in Residence. David Victor (left) performs with Tommy de Carlo of the band BOSTON. By advance reservation, David will conduct one-on-one consultations at Adams Hub with aspiring musicians or music-industry entrepreneurs. 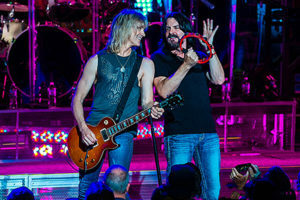 A longtime resident of Los Angeles who now makes his home in the Bay Area, David toured with BOSTON as co-lead vocalist and guitarist and sang lead on the band’s single, Heaven on Earth, from the 2013 album, Life, Love and Hope. The track hit #1 on the Classic Rock charts. David Victor Presents, his company, fields an array of musical offerings, including tribute-style acts Bostyx (the hits of Boston and Styx) Rock in America, described as a “rock n roll joy ride” through hotbeds of musical inspiration in the United States, and Platinum Rock Stars, a full-powered tribute to the icons of classic rock. David also innovated Strum & Spirits, a “paint-and-sip” style group guitar lesson that incorporates teaching, performance and (highly entertaining) storytelling. Companies such as Cisco and Silicon Valley accounting firm Robert Lee Associates have utilized Strum & Spirits as a team-building event. (Imagine a room full of CPAs learning to play “Wild Thing” together!) Strum & Spirits has also proven a hit at wineries and as a completely unique twist for private parties. Yes, everyone gets their own guitars. 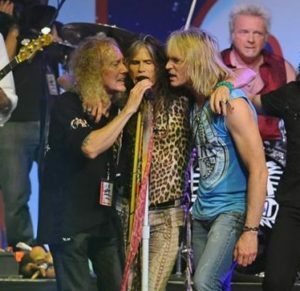 David performs with Curly Smith of BOSTON and Stephen Tyler of Aerosmyth at the Boston Strong benefit concert. Another new venture for David is More Than Acoustic, a San Francisco Bay Area-based, all-new, acoustic rock band, featuring former members of Night Ranger, Eddie Money, Third Eye Blind & Joe Satriani. David Victor Presents is also diversifying into new acts, including Rock Party! A mega-talented party band with a secret-weapon set list that ensures even the stodgiest guests will hit the dance floor. David’s talents go well beyond music; he also owns an enterprise software development firm that serves both his in-house projects and those of outside clients. To reserve a 45-minute consultation with David on Friday, March 16, please email grow@adamshub.com. Space is very limited and sessions are available on a first-come, first-served basis. There is no charge to participate.